Did I ever tell you that Boar loves trains? He has a dream of walking the right of way ala The Station Agent. On our way to Rhinebeck he noticed lots of pedestrians on the old train bridge that crosses the Hudson in Poughkeepsie. Sunday morning we drove around until we found the one end of the path. 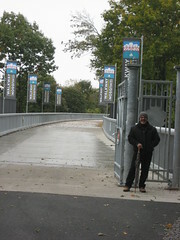 The bridge (and surrounding pathways) have been turned into a state park – Walkway Over the Hudson! Boar was thrilled! so did he walk across it?? I love this photo. And I love when old rail beds are used for bike and pedestrian paths! How nice! Have you and/or Boar visited the High Line in Manhattan? They’re doing a beautiful job turning it into a park! The native plantings are lovely…and there are still tracks left for Boar and his kindred spirits to enjoy. I rowed that section of the Hudson in a crew competition back in high school. It is a beautiful area. It’s so nice that there was something in it for Boar!